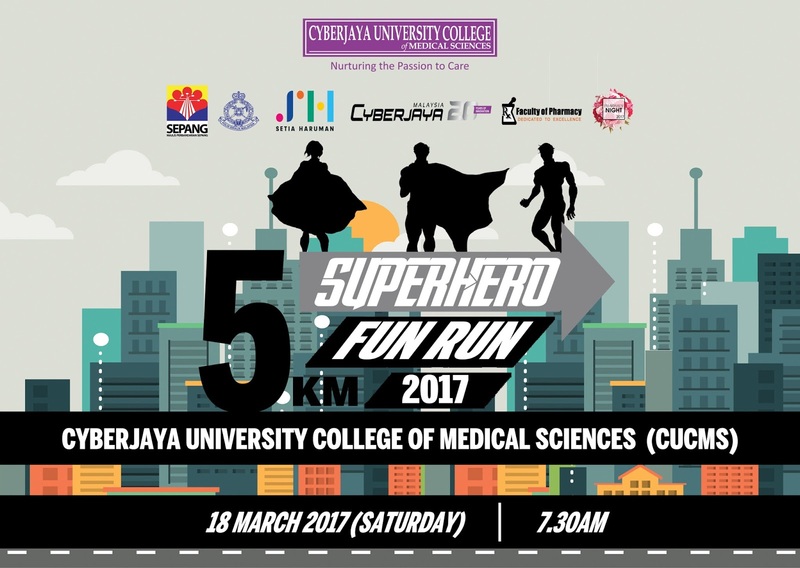 CUCMS’ Pharmacy Student Society will be hosting a SUPERHERO Fun Run on Saturday 18th March. The very first creative run by Cyberjaya University College aims to promote healthy lifestyle amongst Malaysians that is aligned with government’s initiative in educating the importance of practicing healthy lifestyle. Over 500 participants are expected to join this unique event and participants will get a certificate, medal, t-shirt and a running bib. Runners are encouraged to wear their favourite superhero costumes and it will be a memorable run to have runners including adults and children impersonate their superhero. The run is organised as part of the township’s 20th anniversary and participants can register for the run by contacting the organizer from CUCMS, Ms. Sofea (+6019 355 5371) or Mr. Redza (+6013 994 1614). There are still plenty of slots for more runners, don’t miss this opportunity to join the fun in Cyberjaya. This effort is in line with the University’s motto, ‘Nurturing Passion to Care’ and CUCMS encourages students to be active and creative simultaneously. It is also to give an exposure to our students and develop them in a holistic members of society that can contribute positively.